Rachael Ostovich Berdon famed as Rachael Ostovich is a famous American Mixed Martial Artist. She has also competed in the Flyweight division of UFC. In the year 2010, she started MMA career. She is nicknamed as Rachael. UFC Fighter Rachael Ostovich Hospitalized After Alleged Domestic Violence Attack. She was hospitalized on 18th November 2018 in the afternoon after suffering a broken orbital bone following an alleged domestic attack by “someone close to her.” It has opened a felony domestic violence investigation. The identity of the alleged attacker has not been revealed, and no arrests have been made. 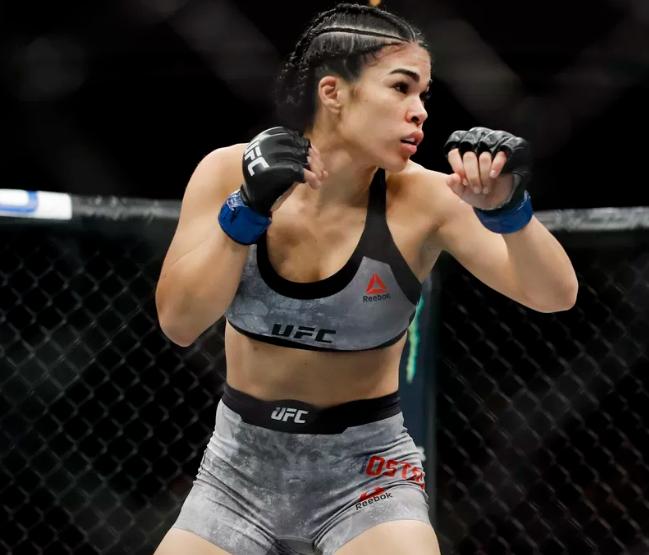 She was released from a Honolulu hospital on 19th November after being treated for a broken eye socket, and MMA Fighting reports that she may have suffered “other possible injuries.” Ostovich, who is 1-1 in her UFC career, is currently slated to face Paige VanZant on the UFC’s first card on ESPN+ in January. Being the best Martial Artist. Rachael Ostovich was born on 21st February 1991 with the birth name of Rachael Ostovich Berdon. Her nationality is American. She was born in Hawaii, USA. Her Zodiac sign is Pisces and her ethnicity is Multiracial Descent. Her religion is Christian. She was born to her father, Robert Ostovich and her mother. Her mother name will be updated soon. There is no any information regarding her siblings and educational qualification but it will be updated very soon. Currently, she is residing in Hawaii, her hometown. Rachael has got a very hot body figure. With her charming smile, she attracts a lot of people towards her. She stands 1.60 m or 5 feet 3 inch tall. She has a balanced weight of 57 Kg or 125 lbs. She has a very healthy body and she always maintains her body a lot. Her bra size is 33B and body measurement is 34-26-35 in. Her shoe size is 6 (US). Her hair color is Black and eye color is Dark Brown. From the year 2010, Rachael began her amateur MMA career. She amassed an undefeated amateur MMA record of 6-0 in more than 3 years. Later, she made her professional MMA debut in January 2014. After that, she joined Invicta Fighting Championships and debuted for the all-female Invicta Fighting Championships in December 2014 where she faced against Evva Johnson and won the fight via split decision. On 12th September 2015, she played her second debut against Andrea Lee but unfortunately, she lost. On 7th May 2016, she made her third debut against Ariel Beck and won the game. On 14th January 2017, she played against Christine Ferea on 14th January 2017 but she lot. After playing in Invicta FC, she moved to "The Ultimate Fighter". In "The Ultimate Fighter 26 Finale" on 1st December 2017, she faced against Karine Gevorgyan where she won in the first round. Then, she faced against Montana de la Rosa on 6th July 2018 but she lost the game. She is scheduled to face Paige VanZant on 19th January 2019 at UFC on ESPN+ 1. The net worth of Rachael is estimated to have $500,000 as of 2018. She is earning a good amount of money and she is satisfied with her net worth. The exact salary of Rachael is not revealed yet but there is no doubt in the mind of her follower that she is earning a considerable amount of salary from her work. She is very successful in her personal life as well as in her professional life. Rachael Ostavich is a married woman with her handsome husband, Arnold Berdon. The couple is also blessed with a daughter named Ruby Rose. The couple is living a very happy life with their daughter and there is no any sign of separation between them. The couple is enjoying their life a lot. She started her career as an MMA fighter in 2010 where she was an amateur she was 6-0. She was featured on the Ultimate Fighter 26. She and Brandon Moreno are both MMA fighters who have fought flyweight.